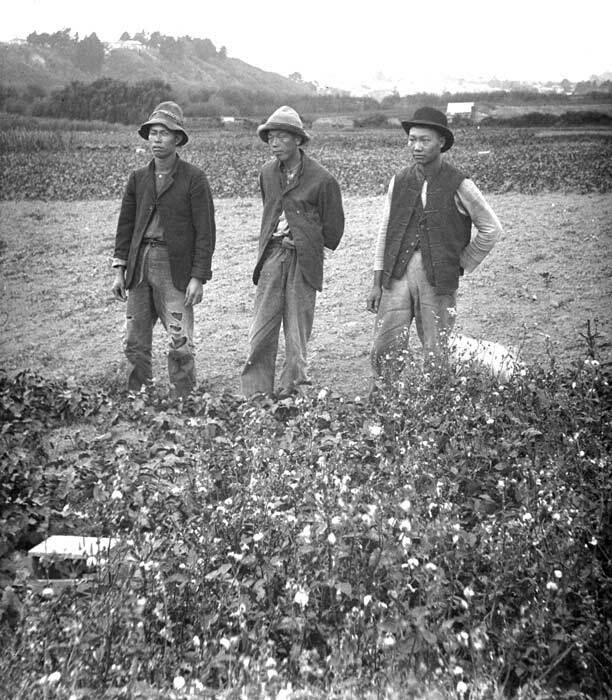 Thousands of Chinese men came to New Zealand in the late 1860s to mine for gold in Otago, Southland and the West Coast of the South Island. Nearly all came from southern China's Guangdong province. When the goldfields were largely worked out, many returned to China. Others chose to stay on despite the prejudices they often faced. The poll tax charged per head, along with other expenses, meant that only the better off could bring wives or fiancées out from China, but some men married Māori or Pākehā women. The men often worked in laundries, small produce shops or in market gardens, like these men shown here in Westmere, Auckland.